Economists point out that the Russian government’s recent food ban is likely to backfire as restaurants and consumers look for new sources for favorite products. Moscow’s home cooks and restaurateurs alike have spent the past two weeks scrambling to find new sources for the ingredients in some of their most popular dishes. On Aug. 7, Russia banned imports of a number of fresh food products from the United States, the EU, Australia and Norway, including meat, fish and shellfish, milk and milk products, vegetables, fruits and nuts. Douglas Steele, the director of operations for the American Diner Company in Moscow, which has nine restaurants serving American diner-style food and has been in the market 16 years, said that while shortages are not an issue yet, the company is preparing for them. "Imported products account for 20 percent of our menu listings,” Steele said. “We are re-working our menu at the moment to reflect the import sanctions. We are particularly affected by menu items that include various cheeses - our bacon blue burger (blue cheese) for example, our Greek salad (feta), our Caesar, which features Grana Padano, our American cheddar, and quality bacon for our burgers. Salmon will be an issue. We have not seen a deficit yet, however, we have seen a dramatic price increase – some as high as 50 percent – for some items from our suppliers. We will be changing our menu next week that will reflect product availability and cost of same." 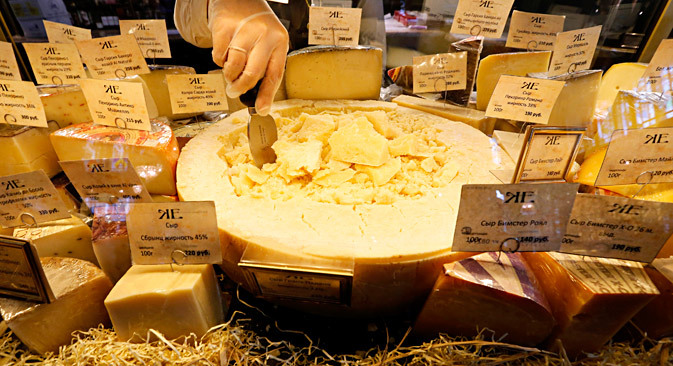 Last year Russia imported about $1.3 billion in food and agricultural products. More than 60 percent of fresh and frozen beef sold in Russia is imported along with 50 percent of fish and seafood, 48 percent of cheese and 45 percent of nuts and fruit, according to reporting from Russian business daily Vedomosti. Alexander Proshenkov, chef of the high-end American import Saxon+Parole, which opened its first branch outside of New York last year, said that his restaurant imports between 70 and 75 percent of the food it sells. “Almost all greens, vegetables, partially seafood and fish, and all oysters come from Europe. We get scallops from the U.S. We'll have to correct the menu. Hopefully we won't experience any losses as everyone is in the same situation, but it's obvious that the prices will grow and the business marginality will go down. We'll have to remove some items from the menu since it's unrealistic to replace them. For example, we'll have to remove the scallops because the Chinese alternative is much worse in quality,” Proshekov said. Although Kosterenko’s restaurants specialize in what he calls “American comfort food,” very few of his suppliers work with American goods, and his experience is not unusual. Russia makes up less than 1 percent of all U.S. agricultural exports. The most notable American food export to Russia is chicken. More than $300 million worth of U.S. chicken was sold to Russia in 2013, according to Reuters. Saxon+Parole’s Proshenkov is concerned about the supplies of greens and seafood. “Now we experience irregular supply of salads, mini romano, for example, and European oysters are almost out. The cheeses won't last long. You surely can feel the general hysteria, but it's a question of time, I'm sure that it's possible to find alternatives for most products. The biggest problem is European cheeses and meat. The prices will surely go up, but hopefully it won't be that bad. One of our biggest challenges now is to keep the pricing policy of our restaurant and not allow the rise in prices. But unfortunately, very little depends on us now." Kosterenko also expressed frustration at his lack of control over the situation. “I'd be gladly buying berries from Russia. We are completely dependent on our suppliers. It's up to them whether the berries will be from the Netherlands or Krasnodar. Our suppliers value our contractual relationships and no one thinks of making money out of it. We're all in the same boat and everyone understands it. If our suppliers ask us to pay a month in advance, we do it,” Kosterenko said. Proshenkov also trusts that his suppliers will meet the demand of his customers. “You surely can feel the general hysteria, but it's a question of time, I'm sure that it's possible to find alternatives for most products,” Proshenkov said. Expats, however, whose only source of foreign food imports is their suitcases and their friends, are already resigned to being without some of their favorite items. Pete, a Moscow DJ, said he would miss marbled beef the most. "Cheese is already off the shelves, prices gone up. These food sanctions are the dumbest thing I've ever seen. Went to [local steakhouse] Torro Grill for dinner last night. They were out of fish and had no idea when they would get more," he said. Nick, a financial analyst, is worried about his emptying Nutella container. "I'm afraid I'll no longer be seeing Nutella at [high-end grocery] Azbuka Vkusa, which is going to be terrible. Honestly, I'm not sure what's going to happen to Azbuka Vkusa in general since everything there is imported, but I'm curious to find out. I have not noticed any hikes in prices yet, but I do expect it to happen soon. I eat at Italian restaurants two or three times a week, and cheese from Italy is mostly forbidden as far as I understand. I expect prices in Italian restaurants to go up here in Moscow." Luzia, a journalism intern, has already noticed price hikes, however. "So far we still can buy stuff. I had just some imported cheese for breakfast. But prices are rising though. The Italian coffee I bought yesterday just doubled,” she said, adding that she wasn’t sure if the price increases were due to availability or unscrupulous suppliers. Analysts agree that consumers in Russia will be the ones most affected by the sanctions. A week after the sanctions were announced, Goldman Sachs analyst Michael Cahill and economist David Mericle wrote in a research note "While sanctions are likely to have a larger impact on the Russian economy, the effect on the euro area economy is likely to be more modest, and the effect on the U.S. economy is likely to be smaller still." Oleg Bucklemishev, director of the Economic Policy Research Center at Moscow State University called the Russian government’s approach “very Soviet,” and said that Russia will suffer the most from the sanctions. "It's going to bring an unavoidable increase in prices while quality goes down – less supply, same demand. We're at loss again. Think of importers and restaurant businesses: switching to new markets and products isn't that easy - some may be ruined. There are also niches where banned products are simply irreplaceable, like in cases of those who have certain diseases that require special nutrition. Additionally, Western partners from all sectors, not just sanctioned ones, will be more demanding towards Russian clients, and may ask for 100 percent pre-payment or use a residual approach,” Bucklemishev said. "We won't punish anyone and won't achieve anything. Competition is the best environment for the development of our manufacturing. Eliminating the competition never brought positive results."